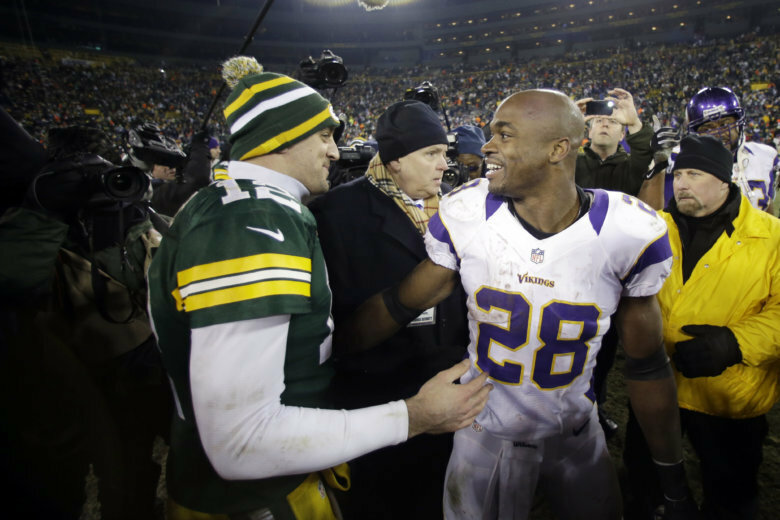 Adrian Peterson and Aaron Rodgers meet on an NFL field for the 15th time Sunday. While Rodgers is showing he can still produce at less than 100 percent health, Peterson is now 33 and with the 1-1 Washington Redskins. LANDOVER, Md. (AP) — Adrian Peterson has played against Aaron Rodgers more than a dozen times and knows not to be surprised by anything. So when the prolific quarterback led the Green Bay Packers to a comeback victory in Week 1 and played well on an injured left knee in Week 2, it was par for the course. Peterson and Rodgers meet on an NFL field for the 15th time Sunday. While Rodgers is showing he can still produce at less than 100 percent health, Peterson is now 33 and with the Washington Redskins, who have their sights set on containing Green Bay’s offense in the hopes of bouncing back from a bad loss to Indianapolis. Neither Packers coach Mike McCarthy nor Rodgers will say how injured the 34-year-old is. Rodgers said his knee was still sore even as he continues to play through the pain. One way to limit Rodgers and the Packers (1-0-1) is holding on to the ball, something the Redskins (1-1) struggled with against the Colts when they went 5 of 15 on third down. Part of that is getting Peterson going like he did in Week 1, and this may be the perfect opportunity because his 1,779 yards rushing against Green Bay are the most of any opponent during his career. Redskins QB Alex Smith is on his third team since the 49ers took him first overall in 2005, the same draft Rodgers slipped to 24. While Rodgers said the two quarterbacks have developed a good friendship, McCarthy was San Francisco’s offensive coordinator during Smith’s rookie season and has been impressed by his ability to handle expectations, moving around and continue to make plays. The Packers should have their three-man backfield back this weekend with the expected return of Aaron Jones. The tailback was suspended by the NFL for the first two games for violating the league’s substance abuse policy. McCarthy has said Jamaal Williams and Ty Montgomery remain atop the depth chart, though it can’t hurt for the Packers to have another option on offense especially with Rodgers banged up. Jones, who showed flashes of potential as a rookie last season, can bring a slashing, physical presence to the backfield. Washington’s offense line that paved the way for a league-best 182 yards in Week 1 was not at its best last week and could use the upcoming time off after the Green Bay game. Left tackle Trent Williams is still dealing with soreness in his surgically repaired right knee, right guard Brandon Scherff injured his right knee against the Colts and left guard Shaun Lauvao could miss some time with a calf injury. With the of shifting center Chase Roullier to left guard and inserting journeyman center Tony Bergstrom into the starting lineup. It appears that the Packers might be without one of their top cornerbacks against the Redskins in Kevin King. He left the tie with the Vikings with a groin injury. If King can’t play, it will leave more snaps for rookie cornerbacks Jaire Alexander and Josh Jackson and veteran Davon House. Alexander, the Packers’ first-round draft pick, is off to a good start in his NFL career in showing the potential to make big plays. His fourth-quarter interception last week against Minnesota was wiped out by a roughing-the-passer call on linebacker Clay Matthews. AP Sports Writer Genaro C. Armas in Green Bay, Wisconsin, contributed.